Did you know potassium is an electrolyte? It is an essential mineral that the body needs. Here is an overview of possible benefits from taking a potassium supplement along with a few recommendations. If you’re a regular at the gym, you’ve undoubtedly been advised at some point that you need to make sure that you consume something with a good amount of Potassium in it, to help your body recover after a workout. But is there any truth to this? How, exactly, does Potassium help? And if it’s really that important, should you consider taking Potassium supplements? Let’s take a look at what potassium supplementation can do for you, and a closer look at some of our favorite potassium supplements in the market. At a basic level, Potassium is an electrolyte: one of the essential minerals in your blood that helps transmit the electrical impulses running all through your body, enabling it to move. It may seem weird to think our body has electric signals running through it, but the truth is that the body is a complex system of cells, tissue, and fluids that are run by these signals sent out by your brain and through your nervous system. While many of these electrolytes are found outside of cells, potassium is one of the minerals inside the cells, making it an important conductor for your body’s neurotransmission process (1). Potassium allows more oxygen to reach your brain, thus stimulating your neural activity and increasing your cognitive abilities; in other words, it helps you process information faster and react quicker. It also plays a major role in how well your brain is able to process and retain information, thus having a direct impact on how well you’re able to learn and remember things. But a potassium deficiency has far more dangers than simply “getting dumber.” It’s no coincidence that people who suffer strokes are often found to have a potassium deficiency since an optimal blood flow to and from the brain reduces the chance from clotting and preventing oxygen from reaching your brain. There are also correlations between potassium deficiency and epilepsy since the disease is tied to abnormal nerve cell activity within the brain (2). Your body needs to have a certain amount of potassium to function properly because potassium is the ion in your cells that stimulates the neural connectivity of muscles and the brain. It would naturally follow, then, that potassium is also vital to the proper growth and recovery of muscle tissue, since it’s directly responsible for your muscles’ contractions and relaxation; muscles grow bigger because we work them to a point of stress, after which they repair themselves to handle that stress again in the future. Also, we all know how much our muscles — and our body as a whole — need water to function and grow. Potassium helps maintain an optimal balance of fluids in the body and ensures that different types of cells get the right amount of fluids that they need in order to function properly. The flipside of this is that potassium also helps prevent muscle cramps, which are caused by low levels of fluids and electrolytes in the muscle tissue. Potassium helps ensure that the protein, carbohydrates, and fats that you consume in your diet perform how they’re supposed to when you consume them. For instance, potassium directly participates in the process of your body using the amino acids in the proteins you’ve consumed and turning it into proteins your body can use. When you consume carbohydrates, potassium as a role in breaking down those carbs into glucose (which is immediately used by your body as a fuel source) or glycogen (which is just a fancy term for your body storing that glucose in your muscles for later use). Do You Really Need A Potassium Supplement? So, with all those great benefits, it would only make sense for you to try and consume as much potassium as you possibly can, right? Potassium is one of seven key electrolytes needed by the body, along with sodium, chloride, magnesium, calcium, phosphate, and bicarbonate. Each one of them services a specific and important role, especially when it comes to ensuring the balance of fluids flowing in and out of the cells in your body. More importantly, all of these electrolytes are delicately balanced this process takes place, meaning that if there’s an imbalance in your electrolytes, it can affect your hydration, nerve impulses, muscle function, and internal pH levels. In other words: you can have too much of a good thing when it comes to Potassium. And yet, there’s also something of a “double-edged” sword when it comes to potassium. Because many of the foods we consume in our diet today are loaded with preservatives, we tend to consume more of those key electrolytes than we often realize. However, potassium is not one of them, which results in a deficiency since we’re consuming much more of those other minerals, versus the amount of potassium we’re getting. So, again: while you do want to be careful to not consume too much potassium, ironically, there’s a good chance you’re probably not getting enough anyway. 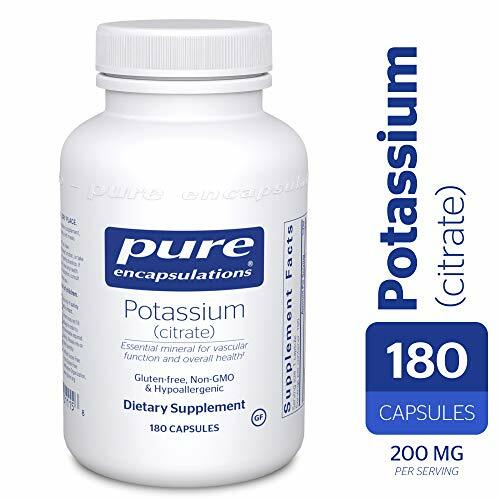 Pure Encapsulations’ potassium supplement contains 200 milligrams of potassium — in the form of potassium citrate — within each capsule. That just means that each capsule technically has the 200mg of potassium referenced, along with another 11mg of ascorbyl palmitate, which is fat-soluble Vitamin C.
REDUCES LEG CRAMPS - Keep the Charlie Horses and cramps away with our high quality Potassium supplement. SLEEP SOUNDLY AT NIGHT - Calm down the cramps and muscles, and find peace when you sleep. BLOOD PRESSURE SUPPORT - Helps control blood pressure by balancing the effects of sodium. 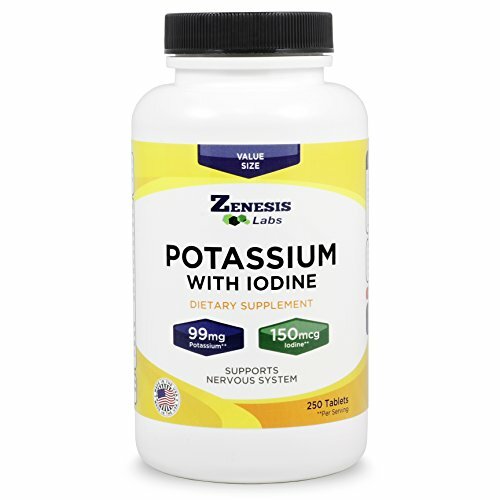 Zenesis Labs’ Potassium Gluconate with Iodine Kelp supplement has 99 milligrams of Potassium gluconate in each tablet, with 150 micrograms of Iodine as well. Potassium gluconate is a form of supplying potassium into our bodies — as opposed to ingesting straight potassium chloride — that’s best suited for people who have normal chloride levels, or for people who need to have their chloride levels restricted. The Iodine helps with your thyroid function, by regulating cellular metabolism and energy production. Zenesis Labs offers a “110% LIFETIME Better Than Money Back Guarantee” which states that if you feel like your life hasn't improved after taking their product, they'll not only give you 100% of your money back, but they'll also donate an additional 10% to charity. 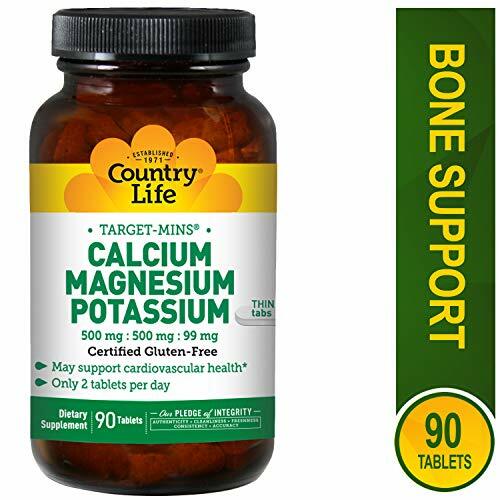 Instead of providing you with just a straight potassium supplement, Country Life’s supplement is a scientific formulation of three of the essential minerals mentioned above — calcium, magnesium, and potassium — that may support cardiovascular health, and are designed for optimum mineral transport. Each serving (two tables) contains 500mg of calcium, 500mg of magnesium, and 99 milligrams of potassium. 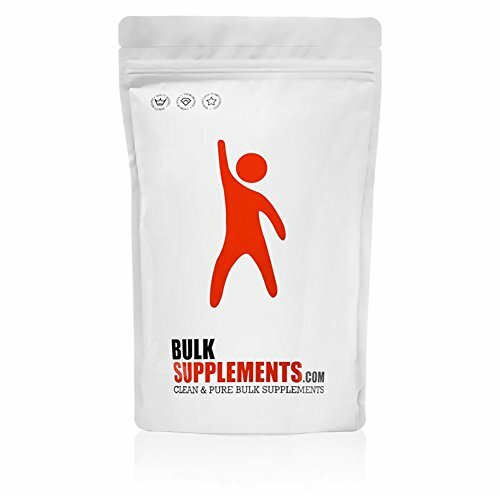 BulkSupplements is a wholesale supplier of over 300 pure nutritional supplements and ingredients for consumers and retailers within the health and fitness industry. Their potassium supplement comes in the form of potassium citrate. However, while the serving size for BulkSupplements’ potassium supplement is 275mg according to the label, the amount of actual potassium within said serving is only 99mg. This begs the question: what makes up the other 176mg? 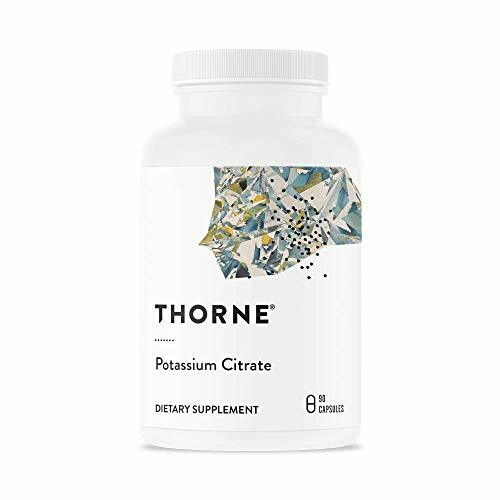 Bulksupplements.com does say that their potassium citrate is "clean & pure powder" with "no fillers"
Thorne Research takes great pride in setting the standard for the exceptional formulation and quality manufacturing of nutritional supplements for the past 33 years. One of their key differentiation points is that their products are formulated by a team of MD’s, Ph.D.’s, and ND’s, and they have worked with top-tier medical groups and research institutes to conduct clinical studies on over 40 of their products. In addition, one of the neat things about Thorne Research company is that they’re the exclusive partner of multiple United States national teams, including USA soccer and USA gymnastics. Potassium is one of those minerals that people know they need, but don’t really understand how important it really is for them. However, the truth is your “average” person who works out a few days a week and consumes a diet that has a respectable amount of fruits, vegetables, and healthy fats probably get enough potassium such that they don’t really need a supplement. But there are also many people who don’t quite fall into that “average person” definition we outlined. There are some people who exercise more often and more intensely, meaning that the demands and strains they place on their body are much greater. Conversely, there are also people who don’t take quite as good care of themselves and have a diet rich in processed foods that could lead to a mineral imbalance. Regardless of which group you find yourself in, we highly recommend the Zenesis Labs’ Potassium Gluconate with Iodine Kelp product, because of both the quality of the product, as well as their “better than money back guarantee.” That helps you take the risk out of giving this supplement a try.